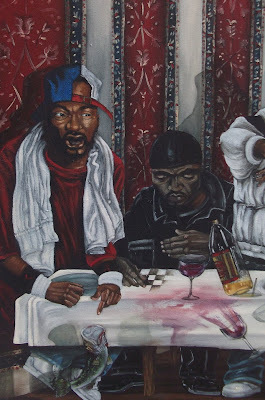 who did die, has a last supper, Wu Tang Clan style. as fridays at the CREATIVE GROVE artist & designer market, saturdays Meatpacking District, sundays on Bedford Ave x N6th street. a special reception for saturday, 4/2 in MANHATTAN, location to be announced. a performance art installation in various locations around NYC. Eva Moll's iconic character Eve, who after years of Eve and the Big Apple, Eve and the garden of paradise, evolved to Eve committing suicide. The painting comes alive with this performance piece, the process of embodying the painting through body art, costumes and props, involving the attending public in each step and location. Eva Moll is using the public space as her canvas, the performance piece as her paint. Her own appearance accompanied by the green foliage of paradise (talking leaves, since Uta Brauser will never shut up) are leaving splashes of color in the memories of who had the opportunity to witness.